The Boy Scouts of America needs to get it together. No, I am not talking about their inability to make delicious cookies. The BSA has openly reaffirmed its policy against members of the LGBT community in their private organization. 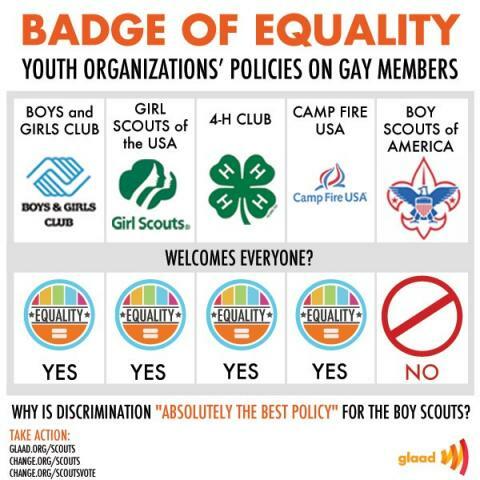 They have removed gay leaders and scouts only to confirm that the organization’s leaders are backwards pieces of crap. As many of you know, or may not, I was an active scout all the way from Tigers to Eagle. That’s right, I spent about 10 years in the boy scouts and worked very hard to reach the rank of Eagle, the highest ranking in the Boy Scouts. Going through high school while trying to balance grades, social pressures and fun was not exactly easy with Boy Scouts as an extracurricular. And as everyone knows, being a boy scout isn’t exactly the coolest thing to do around town. Often it felt like I was leading a double life, trying to be the cool guy with my friends and then once a week and during outings, a scout. As time filled in the gap between high school and my current position in life, I became more confident about my scouting history. I had always been proud of my accomplishments and thought highly of my times in the Scouts. And then I started to become aware of this little problem they have with the gay community. What a bunch of idiots. The Boy Scouts have so much to offer; so much that I, personally, have benefited from. I would even like to have my kids someday experience scouting. But their homophobia is ruining everything not just for LGBT scouts but also for the rest of us that want to be proud of our affiliation. Its almost funny that I used to not tell people that I was a boy scout because I didn’t want them to think I was uncool and now I still I don’t want to tell people but for an entirely different reason. It’s not a full reversal from their previous stance but its certainly a big step in the right direction. The board has since then punted their decision until at least May. That’s not a great sign but we’ll just have to wait and see. News came out today that a bill in California has been introduced to remove the tax exempt status for organizations that exclude gay members. Maybe that will push the organization in the right direction. The sad truth is that this is not just a moral viewpoint to which the Boy Scouts are clinging. It all comes back to money and the fact is that by changing their policy, the BSA could, and probably will, lose millions of dollars from conservative donors. Almost 70% of Boy Scout units are chartered by faith based organizations. The largest of which is the The Church of Jesus Christ of Latter-day Saints with over 15% scouts represented. Most of these churches don’t exactly have an open door policy on gay members. However the pendulum of popular opinion is starting to sway donors in the other direction, Merck, UPS and Intel have all pulled funding due to the BSA’s anti-gay policies. We’ll just have to wait and see if the BSA can make the right decision in spite of the difficult short term funding problems it could have.